There's nothing more heart wrenching than discovering that a website has been the subject of a spam or malware attack. It's stressful as anything you will encounter in your professional career and can put you more than a few paces behind the competition in the quest to Web success. Google has long notified webmasters when the software being run on their website was out of date and even established a help portal for hacked site with articles providing guidance on how to recover quickly. 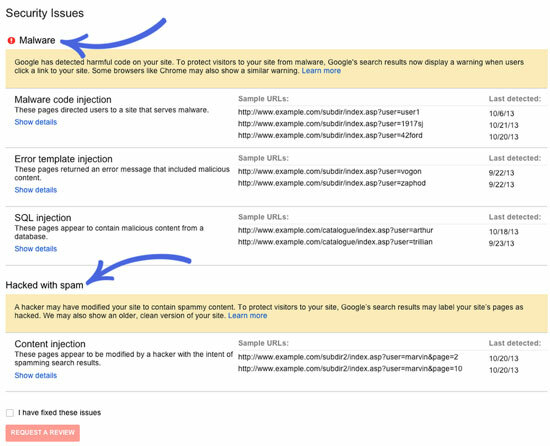 This week Google took its security initiatives a step further however by introducing a new feature within Webmaster Tools that will help verified site owners find information about the security issues affective their site, pinpoint the problem with detailed code snippets and request review for issues directly through the platform.